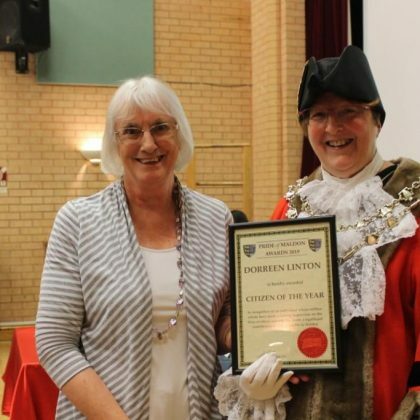 Nominate a local person of any age, or an organisation, who you think deserves to win an Award. It may be for a single act of kindness, a long-lasting battle against the odds, or for inspirational community work. 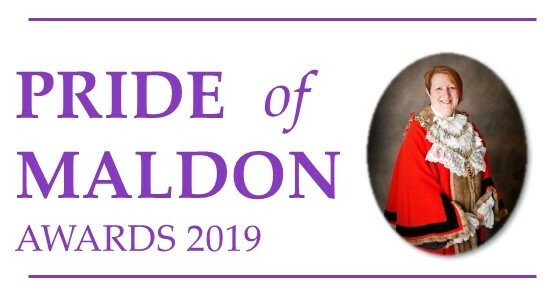 In an evening buzzing with excitement and anticipation to rival the Oscars, the Pride of Maldon Awards Evening took place on Tuesday night under the watchful eye of Master of Ceremonies, Cllr Mark Heard. With so many nominations to choose from, the panel had a hard job narrowing it down to just 9 awards. 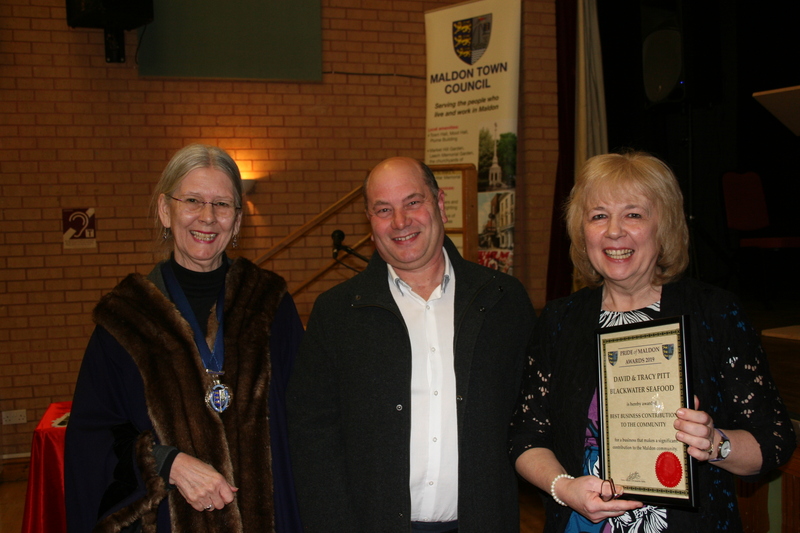 Following an inspiring speech about what makes Maldon so special from Carl Wakefield, Principal of the Plume Academy, and musical performances from Cameron Morrison, and singers Beth and Ella Butcher, who are all pupils at the Plume Academy, the prestigious PRIDE OF MALDON AWARD 2019 was announced by the Town Mayor, Cllr Jeanette Stilts. 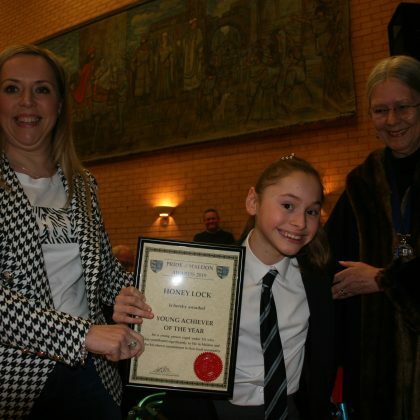 The worthy recipient was Rhiain Oakley, the Community Champion from Tesco, a post she has held for four years, always ensuing that her company’s community commitment is maximised. 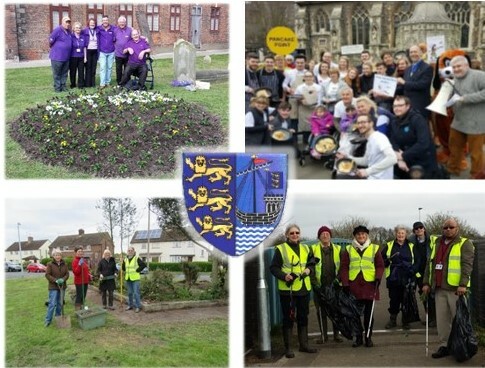 Having lived all her life in Maldon, Rhiain has an intimate knowledge of the needs of local charities and good causes and provides many products and prizes for charity events, as well as directing surplus food to local community restaurants. Rhiain uses her personality to inspire Tesco employees to help with refreshments at the Maldon Mud Race and Carnival and encourages their participation in the Race for Life. 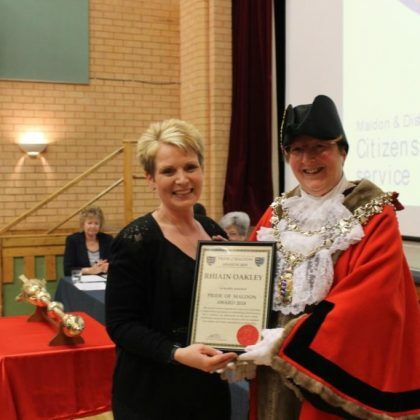 As the Town Mayor said “Rhiain’s dedication and commitment to use her position to support good causes within the Maldon community deserves special recognition. 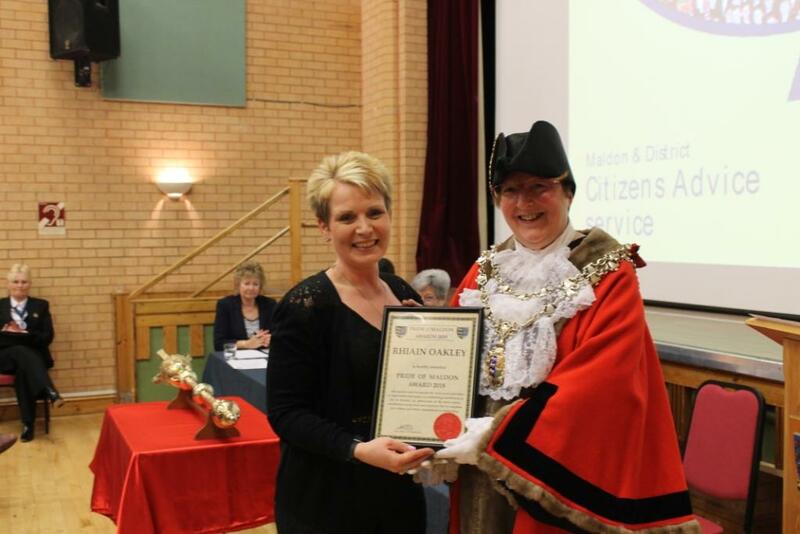 She influences the lives of numerous people and works tirelessly to go the “extra mile”. 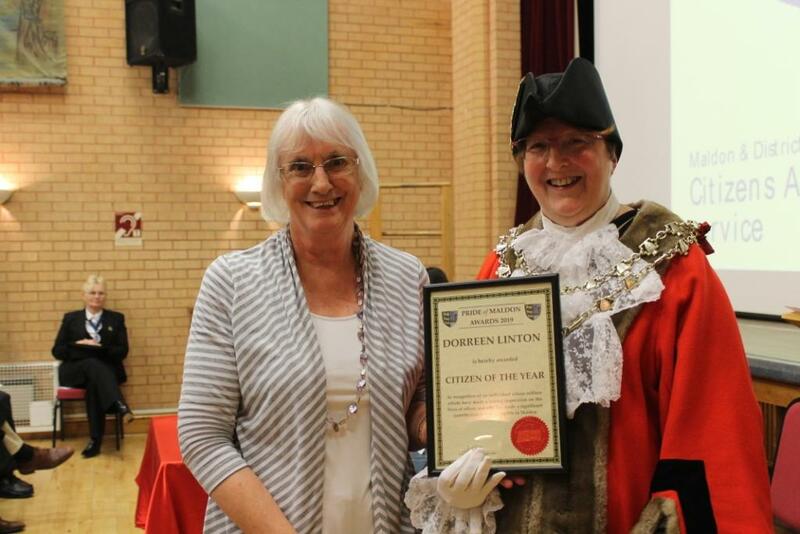 CITIZEN OF THE YEAR – introduced Cllr Peter Stilts and awarded to Dorreen Linton whose tireless efforts over many years with several organisations have had a massive impact on Maldon. 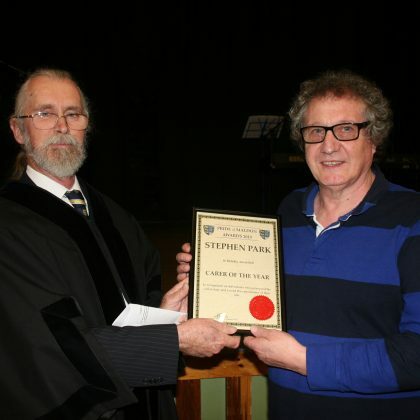 CARER OF THE YEAR – introduced and presented by Cllr Richard Ford to Stephen Park for the way he cares for his partner and supports other groups. 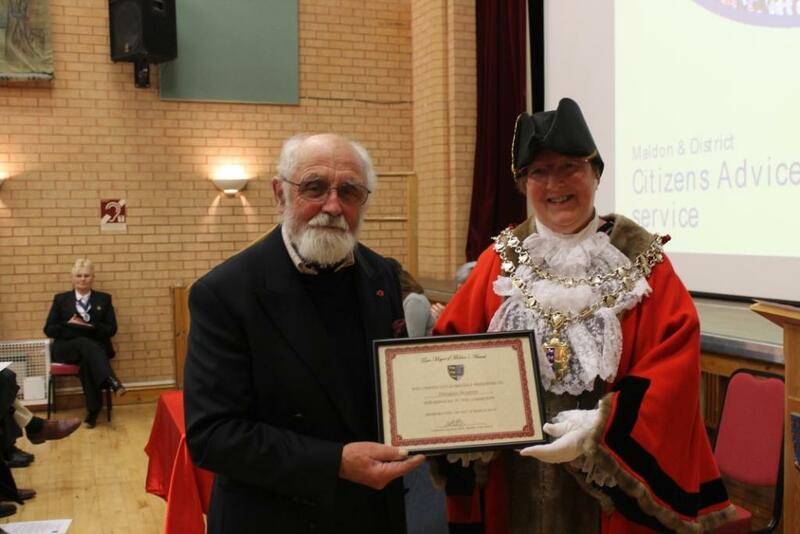 He is also an active member of the Maldon and Dengie Stroke Support Group and founder member of Maldon’s Aphasia Café. 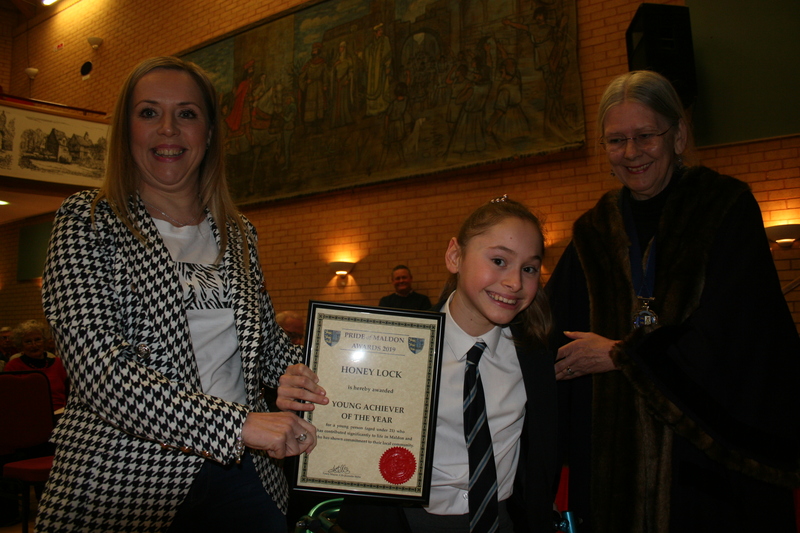 YOUNG ACHIEVER OF THE YEAR – introduced by Cllr Flo Shaughnessy, Deputy Town Mayor, and presented to Honey Lock, a Plume Academy student, who has shown tremendous resilience to extreme adversity in a way which has been truly inspiring to so many people. 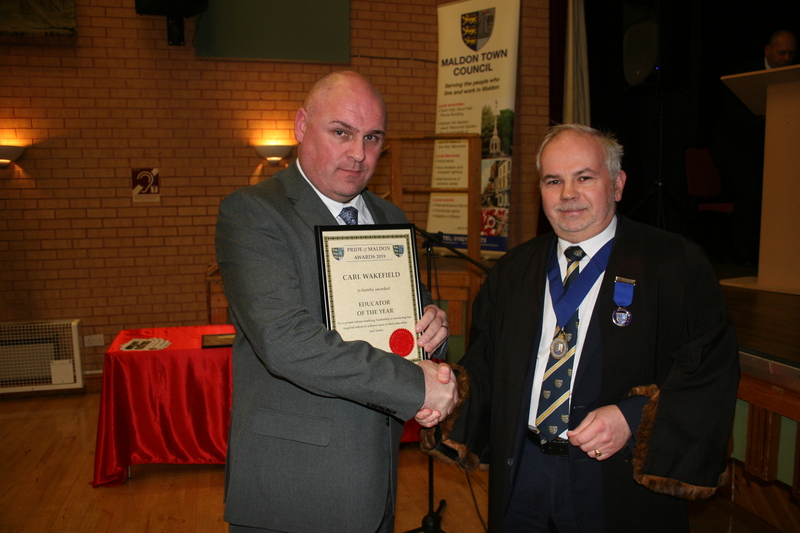 EDUCATOR OF THE YEAR – introduced and presented by Cllr Stephen Nunn to Carl Wakefield, Principal of the Plume Academy, who has greatly raised the standards at the school and is a great ambassador for the education system and an inspiration to many. 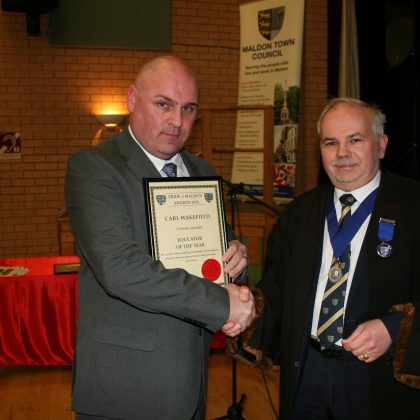 Carl was pleased to accept the award on behalf of the whole team at the Plume Academy. 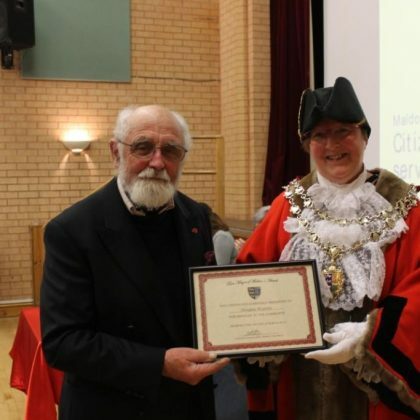 COMMUNITY IMPACT AWARD – introduced and presented by Cllr Martin Harvey to Peter Condon, on behalf of Steve Cant from Appletons who does such an important job clearing up the litter in the Town Centre, and who always has a smile on his face and a cheery greeting, whatever the weather. 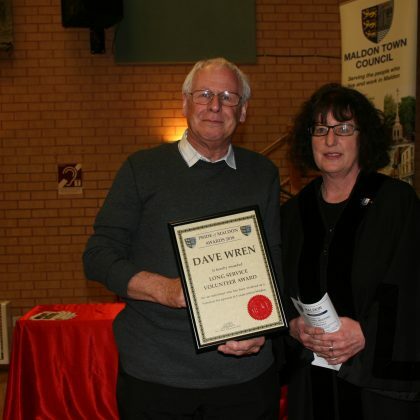 He has been working in the same area for many years and is a well-known friendly face to local residents. 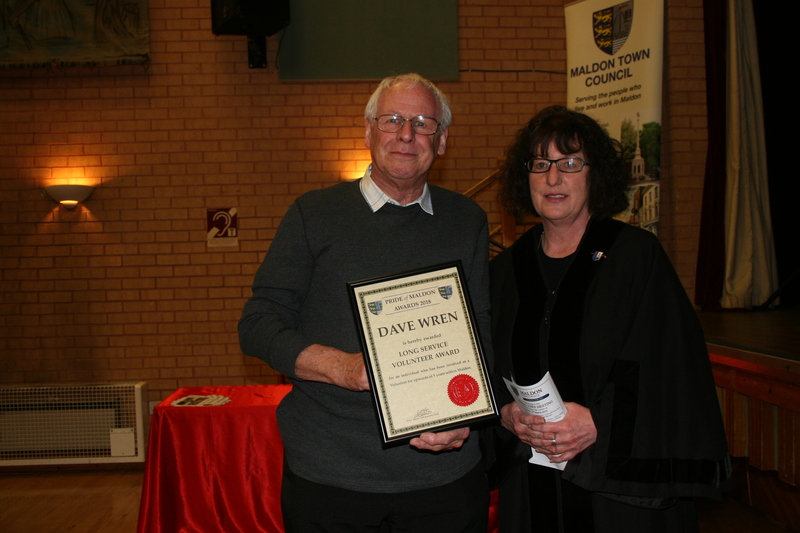 LONG SERVICE VOLUNTEER – introduced and presented by Cllr Lillian Dowling to David Wren for his volunteering with the Maldon & Denbie Stroke Support and Carers Group. He is an integral part of the team, silently carrying out all the roles not delegated to others. 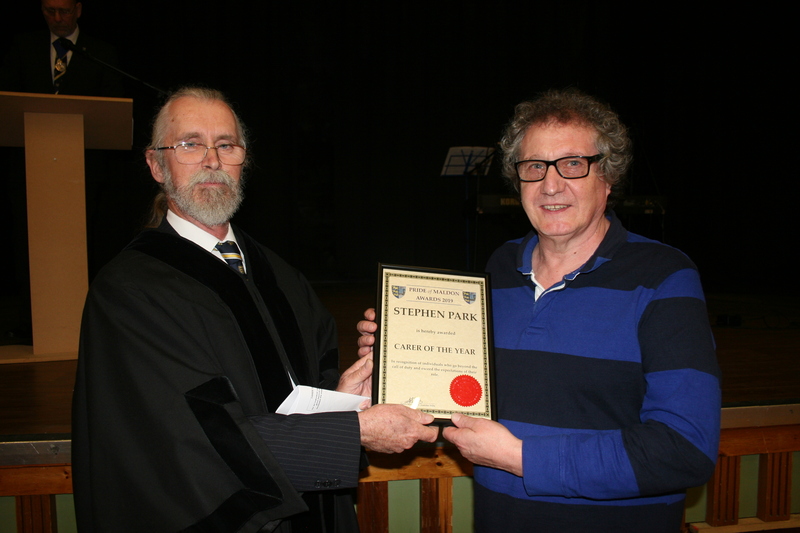 ARTS & CULTURE AWARD – introduced and presented by Cllr Kevin Lagan to Neil Fisher from the Maldon Drama Group, who conceived, researched, wrote and produced the WW1 Centenary Commemoration show “Hope Flowers”. The show, which “sold out” raised £3100 for the RBL poppy appeal. 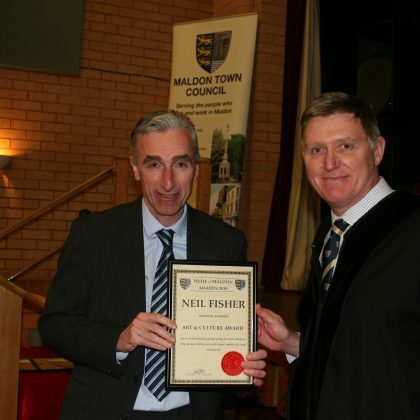 Neil paid tribute to the whole Maldon Drama Group team effort for this production. 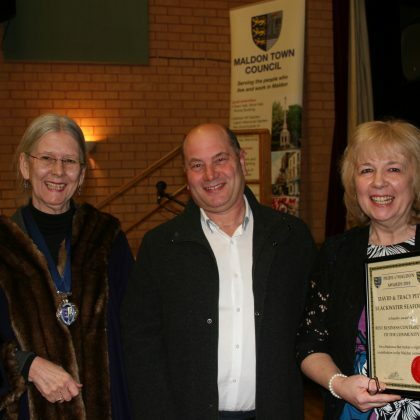 BEST BUSINESS CONTRIBUTION TO THE COMMUNITY – introduced and presented by Cllr Flo Shaughnessy, Deputy Town Mayor, to David and Tracy Pitt from Blackwater Seafood, noting that the way David has served the community and kept the riverfront traditions alive is highly valuable to our town, bringing in tourists and maintaining the oyster beds for the future.